Jantz took time out of his heavy litigation schedule to present on January 17th in the first Social Justice Lunchbox Series event of 2018. This Series is funded by a grant from the W.K. Kellogg Foundation to help improve outcomes for New Mexico’s most vulnerable children and families. UNM Law Students and members of the public are invited to attend to learn about a wide range of social justice issues. The Environmental Law Society co-sponsored this presentation. ,In his talk, Jantz introduced the idea of environmental racism and discussed some strategies to avoid this, such as making sure environmental decisions are made with the input of potentially affected communities. He provided information on President Clinton’s Executive Order 12898 and laws designed to reduce the impact to vulnerable communities, such as NEPA (The National Environmental Policy Act of 1969) and Title VI of the Civil Rights Act from 1964, noting that Tribal, local, and state laws may provide more protections than federal laws. In particular, Jantz cited the Navajo Nation law that no new uranium mining may take place on tribal land until former sites are cleaned up. Although uranium itself is a hazardous material, radioactive mine waste creates grave danger, contaminating ground water and the very air, as dust particles are borne aloft by the wind. There is a site outside of Milan containing 21 million tons of mine waste that poisons our New Mexico environment to this day. Jantz cited scientific research that reveals multiple human organs are affected causing high rates of cancers, among other maladies, as radioactive materials and toxic chemicals are processed through the body’s natural filters, such as the kidneys. 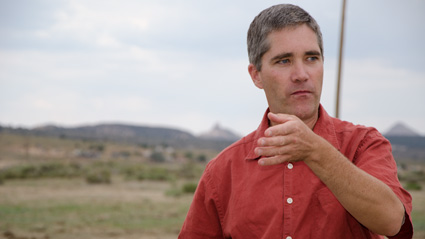 As evidence that race and poverty affect placement of such dangerous mines, Jantz pointed out that there are significant uranium deposits left undisturbed in comparatively wealthy Santa Fe county while mining companies still target sites in Indian country. Higher levels of chemical air pollution (including benzene, toluene and industrial paint thinners and solvents) are present in higher levels in Albuquerque’s lower income communities, with regulators failing to conduct even baseline testing. Student Zoila Alvarez remarked how little the local community members know about environmental issues in their own backyards. Jantz told the audience that many environmental justice issues are brought to the forefront by community-driven science projects. The next Social Justice Lunchbox series will be a presentation on Working with Communities by Adriel Orozco of the NM Immigrant Law Center on February 14, 2018 at 12:00 pm in room 3416. Snacks and water will be provided; attendees are invited to bring lunch.